Hungary's low cost airline Wizz Air in January-October 2018 transported over 1.2 million passengers on flights from/to Ukraine, which is a 2.1-fold rise year-over-year. "During the first 10 months of 2018, the airline carried more than 1.2 million passengers on its low cost routes to/from Ukraine, which is 110% growth compared to last year and makes Wizz Air the largest low cost carrier in Ukraine," the press service of the airline reported. 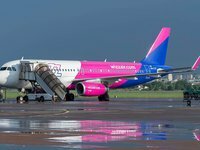 According to the press service, for 2019 Wizz Air announced four new routes: from Kyiv to Bremen, Billund and Riga, and also from Lviv to Copenhagen. The airline also confirmed its intention to deploy the fourth Airbus A320 at its base in Kyiv. As reported, Wizz Air offers flights on 41 routes to 12 countries from three Ukrainian cities - Kyiv, Lviv and Kharkiv. KYIV. Nov 13 (Interfax-Ukraine) – Hungary's low cost airline Wizz Air in January-October 2018 transported over 1.2 million passengers on flights from/to Ukraine, which is a 2.1-fold rise year-over-year.